Despite changes in marketing mantras these days, there is even more reason to still “Think Ford First,” as it seems to be enhanced to mean - think Ford global technology and its entry into advanced vehicles that can be sold anywhere around the globe. While the first Ford cars ever shipped to Europe were in 1903, the same year Ford Motor Company was founded, European production came much later in 1911. That’s not the case today. Ford’s not making any delay this time. Announcing major vehicle directions at the 2011 North American International Auto Show in Detroit is now followed with an equivalent European emphasis. Witness the plethora of technology announcements to be unveiled in Geneva as Ford of Europe Chairman and CEO Stephen T. Odell will reveal a groundbreaking all-new vehicle during the Ford news conference. According the Ford news release, even Ford CEO Alan Mulally will make a unique video appearance during the news conference, from Hanover in Germany, where he will be giving a keynote speech that day at CeBIT, Europe’s largest technology show. Key news about upcoming Ford-exclusive customer-friendly technologies will be mingled with debuts specific to Europe, like the European debut of the Ford Focus Electric, Ford’s first all-electric passenger car. Ford show stand will feature the Fiesta RS WRC. Not to be outdone, Ford will include the Global debut of the all-new Ford Ranger Wildtrak. Among the many tech features, the new Ford Ranger, for example, features an extensive range of class-leading “smart” features to make it easier, safer and more fun to drive than ever. It also sports a unique Rear View Camera System – the camera image is displayed in the rear view mirror – which dramatically improves visibility and simplifies hooking up to a trailer. The point is, what used to be more commonly found on premium or luxury cars, vehicles like the Ranger are fitted with technologies such as satellite navigation and Bluetooth® voice control. Even the Focus Electric is designed to offer sufficient range to cover the majority of daily driving habits. 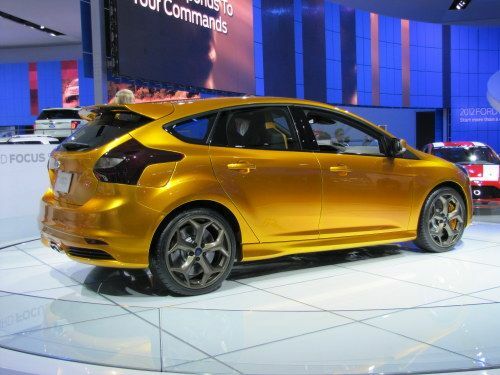 Based on the all-new sleek and stylish five-door Focus hatchback, it leverages Ford’s global C-car platform, also shared by petrol and diesel versions of the Focus that will shortly go on sale in Europe and North America. Moreover, the combination of the 1.6-litre Duratorq TDCi and Ford Auto-Start-Stop system is intended to build a solid foundation for the new Ford Mondeo ECOnetic, which boasts homologated CO2 emissions as low as 114 g/km. With a technology and vehicle suite like that, Ford is indeed attempting to have every automotive want and need covered.